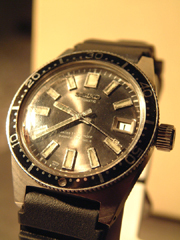 The first diver's watch made in Japan. As for the movement, the self winding mechanical caliber  of five beats is carried. The case is made of stainless steel and the cover glass is using organic curve type glass.